This week we are visiting the small country town of Wellington which was officially established back in 1840. The first inhabitants of the Berg River valley were the San and Khoi groups of people.Many artefacts confirming their existence have been found in the Bainskloof mountains and the hills that surround Wellington. Visitors can view them in the local Wellington Museum. When the Dutch were in control of the Cape they specified where people could go as the interior of SA had not yet been opened up. The Wellington valley served as the last check post for wagons leaving the Cape for the interior and was called the Limiet Valley (Limit or frontier valley) by farmers and trekkers of that time. 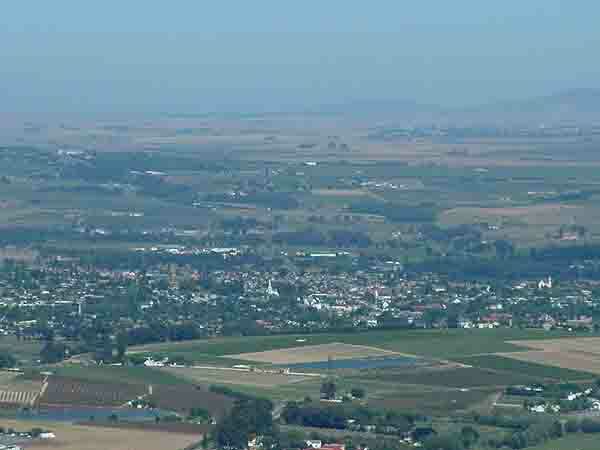 Later when the French Huguenots settled there its name was changed to Wagenmakersvallei. (Wagon makers valley) After 1840 the name was changed again to its present name of Wellington. The name was changed to honour of The Duke of Wellington, the man who conquered Napoleon. The town is about a 45 minute drive from the centre of Cape Town Close to the town is the Kromme River which flows through the picturesque valley.The town has about 39000 inhabitants who live in the immediate area and on farms around the town. People might ask, what use is a town out in the country if there is nothing to do or see there. Thats just where you are wrong. Wellington has its own wine route, albeit smaller than other towns, it still boasts six wine cellars. Visitors are welcome to visit the various cellars and enjoy the hospitality of the Bolanders. The winemakers of this area have a proud heritage with many of their wines having won prizes on national and international wine shows. Back in 1883 when the vineyards were being destroyed by a plant louse many of the farmers gave up on their vineyards and planted fruit trees instead. Their fruit farming flourished and in 1908 The South African Dried Fruit Board was established when farmers got together to establish a co op for the marketing of their prunes. Today the SADF has its impressive headquarters in Wellington and packages, distributes and markets its products from there. Wellington is also well known for its educational institutions. The Huguenot Seminary for girls was founded back in 1874 by Dr Andrew Murray, a Dutch Reformed minister who realised that education for girls in the area was non existent. It later became a teachers training college and today trains social workers and missionaries. The Cape Technicon also has a campus in Wellington and is the only institution that provides teaching in Afrikaans for teachers. The town also boasts a number of buildings dating back hundreds of years, and as is always the case in a country town in SA, a large Dutch Reformed Church. Many of the streets are lined with the beautiful Pride of India trees which are in full bloom at the moment. There is one interesting fact that I have failed to mention and that is that the train line through Bainskloof from the north runs through Wellington. Anybody using the line will notice that all trains including the mainline trains stop at the Wellington Station. �Why? � you may ask. It was a condition stipulated by the man who donated the land for the station that every train moving through the station stop there. The agreement is still adhered to today. To obtain information on where to find all the interesting places that are on show in the town visit the local information bureau. You'll be amazed at what there is to see and do in Wellington.